Lourdes Estrada, Ph.D., assistant professor of Cancer Biology, has been named associate director for Academic Programs and Operations for the Medical Scientist Training Program (MSTP). Estrada completed her undergraduate degree at the University of Puerto Rico, Rio Piedras. She earned a Ph.D. in pharmacology at the University of Michigan, where she then completed her post doctorate research. 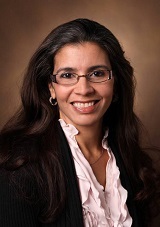 After working in the private sector, Estrada came to Vanderbilt in 2004 as a scientific and education coordinator for the Center for Cancer Systems Biology. Over the past 12 years, Estrada has designed a graduate-level cancer systems biology course; co-developed the immersion phase of Curriculum 2.0; and served as a case-based learning facilitator. She served on the Vanderbilt University School of Medicine Admissions Committee for more than five years and served as a Portfolio Coach to help students critically appraise documented evidence about their performance and translate those assessments into action plans for future learning. “Lourdes is truly an exceptional individual and she brings an outstanding skill set to the MSTP. She helped design curriculum 2.0 and clearly has a passion for innovating in graduate education, mentoring students and increasing student diversity. We certainly are very fortunate to have recruited her to this new role,” said Chris Williams, M.D., Ph.D., director, Medical Scientist Training Program, associate dean for Physician-Scientist Education and Training and associate professor of Medicine and Cancer Biology. The MSTP, which awards both the M.D. and Ph.D. degrees to its graduates, has been in place at Vanderbilt for 50 years, and has received funding from the National Institutes of Health for the past 38 years, Estrada said. The MSTP prepares students for faculty and research positions of leadership in the biomedical sciences. Vanderbilt’s seven-year program provides students with an integrated curriculum that features a strong core education in medicine and intensive training in scientific inquiry.